Technical Details: Total Nitrogen 20% 2.1% Nitrate Nitrogen 17.9% Urea Nitrogen Available Phosphate 20% Soluble Po tash 20% Boron 0.02% Copper 0.05% 0.05% Chelated Copper Iron 0.10% 0.10% Chelated Iron Manganese ese 0.05% 0.05% Chelated Manganese Molybdenum 0.0009% Zinc 0.05% 0.05% Chelated Zinc Product Description: Professional fertilizers made from the finest raw materials. - Dissolves faster and cakes less than other top brands. Chelated formulas for improved performance. Includes a blue color tracer.17-6-6 General Purpose - For maintaining plants. Fast green-up and expansion. 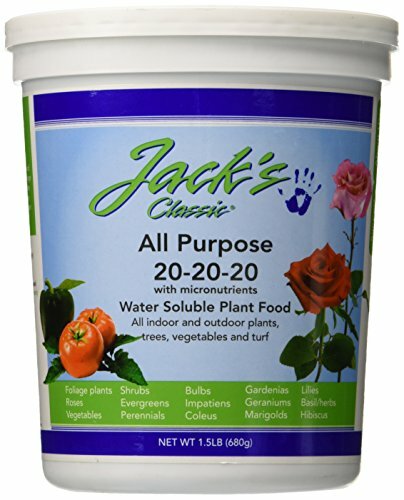 Formulated for root and shoot growth. View More In Soils, Fertilizers & Mulches. If you have any questions about this product by JR Peters, contact us by completing and submitting the form below. If you are looking for a specif part number, please include it with your message.